Though the origins of block carving are lost in the folds of history, we have examples of block printed fabric dating back to 2000 B.C. Evidence has been found that the art of dyeing fabrics was practiced in the Indus Valley Civilisation. According to the 1961 Census conducted by the Government of India, the craft was developed and specialised by the Suthar artisans who were traditionally carpenters. The document also mentions that the craft might have been adopted from Iran at the time of the Mughals and concentrated in Shikarpur in Sindh from where it spread to Gujarat. This is in keeping with the theory that the skill of block printed fabrics travelled from Sindh to the modern Indian states of Rajasthan, Gujarat and Western Madhya Pradesh. The block makers of Pethapur believe that many centuries ago, women got tired of their white unembellished clothes and began using their bangles dipped in colour to pattern their garments. The carpenters noticed and decided to provide the women with various designs and so gave rise to the tradition of hand block printing on textiles. Most of the craftsmen engaged in this work belonged to the Gajjar Suthar caste who believe that their ancestors settled in Pethapur some 200 years ago. The caste believes it is the progeny of Vishvakarma, the architect of the gods1. Like the hand block printers, block making is an endangered craft. These talented craftsmen, similar to so many other craftspersons in India, face the problem of situating themselves within the contemporary market economy, in attempting to create and develop products which might curb the widening divide between greater supply and diminishing demand. The block makers had a few prominent clusters in Pilakhuwa, Farukhabad and Ahmedabad which supplied the printers of the country. It is from Ahmedabad that the block carvers migrated to Pethapur, which today is the only remaining centre in the country solely making wooden blocks. 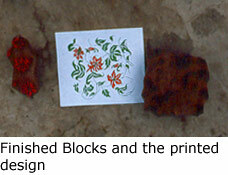 It supplies to all the hand block printing communities from Sanganer (Rajasthan) to Bagh (Madhya Pradesh). In other centres, Pilakhuwa for instance, the block makers have applied their carving techniques to making wooden tables, boxes, photo frames, pen holders etc to broaden their market and continue their trade. 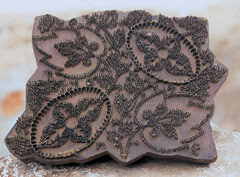 Pethapur, situated 40 kilometres from Ahmedabad, is the only surviving centre of wood block carving. Blocks are ordered and sold directly between the printer and carver with no middlemen or agents. Either the block maker travels to the printing centre with his directory of designs on which orders are taken or the printer goes to the carver, either ordering from the block makers design repertoire or giving his own design layout. 1 Census of India 1961:7. The wood is bought in an open market. The most common wood is teak (sag) or (sag saghwan) preferred because of its durability and resistance to termites and decay. It is locally known as (sag2 patli). Despite its durability, the wood is soft and easy to carve. It is also fibreless so especially suitable for fine work. It is bought from the forests of Southern Gujarat. When bought the wood is in uneven pieces called (wadh). It is stored in a dark enclosed space for up to one year. Once the wood is ready the edges are shaped with the saw, chisel and adze to give it the desired shape – oblong, square or round, depending on the design. The surface to be carved is filed and smoothened by grinding on a rough stone on which is spread fine river sand and water. 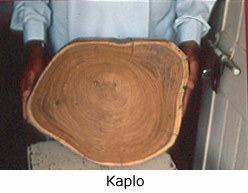 The shaped smoothened block is known as (kaplo. The (kaplo) is now ready for the design to be traced on its surface and carved. For any design two types of blocks are carved today: the main block with the outline called (rekh) and the subsidiary or relative blocks for each colour called (data3). They are both carved in relief. The smoothened surface is coated with the layer of white chalk to aid definition and visibility of the traced design. The design is first drawn on paper. This paper is fixed to the whitened surface of block, held in place with nails. Using a fine tipped or pointed chisel the design is perforated onto the block. Once the design is traced onto the block, the negative spaces are carved or gouged using a variety of different shaped and sized chisels. If the spaces to be removed are vast, a hand drill is used. Once the block has been carved the block makers finish by engraving a nail shaped point, (mokh), on the right hand corner of the block. This enables the printer to precisely align the blocks while printing. The four sides of the block are sloped, narrow at the top slanting outwards at the base where the design is carved. In the case of dense designs such as floral patterns or closely carved designs holes are drilled through the block to allow trapped air to release and thus ensure air bubbles don’t smudge the print or spread the colour. These air passages are called (pavan-sar). The handle (chhado) is either carved from the block or attached later. The first is more durable and also more expensive. After the carving is complete and the block is ready it is placed in groundnut oil for a couple of days to season the wood and protect it from climatic changes and moisture. This ensures the block doesn’t warp through repeated use. 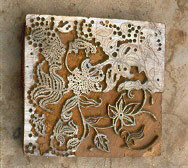 It takes up to three days to carve a block set of an intricate design. An alternative technique to carving in wood is blocks where the designs are created by attaching metal wires or strips to a wooden base. Such blocks are almost always (rekhs) and save the labour of carving the main block. After tracing the design onto the (kaplo), narrow grooves are carved with chisels, flat in case of a geometric pattern and pointed for floral motifs. Strips or wires are then fixed in the carved grooves or dots as the case may be. These blocks are durable as they don’t chip while cleaning as often happens with wooden blocks. They are mostly in demand by larger factories that mass produce goods. The future of the block carvers of Pethapur is uncertain. It is entirely possible that they will follow the other block making traditions and apply their skill to making products which have a wider and also urban market. This would ensure the continuity of the knowledge but it would be unfortunate if in the process the beautiful hand printed fabrics which India has been renowned for since the beginning of civilization become extinct. 2Tectona Grandis or Indian Oak.